Ultra Duramune DAP(Elanco) rehydrate each dose with Sterile Diluent supplied into a 0.5 ml dose and administer SubQ to puppies 6 week of age or older, revaccinate every 2 to 3 weeks until at least 12 weeks of age. 25 single doses. Order syringes and needed separately. Ultra Duramune DAP aids in the prevention of disease caused by canine distemper, infectious hepatitis, canine adenovirus type 2 and canine parvovirus(CPV). 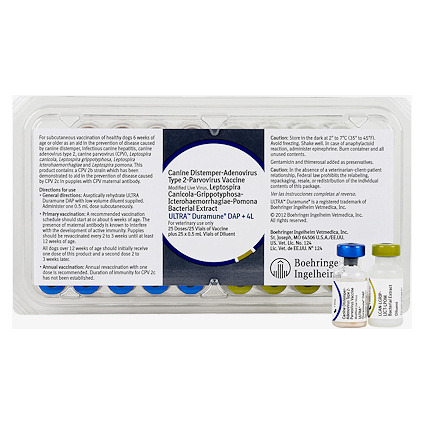 This vaccine contains a CPV 2b parvo strain which has been demonstrated to aid in the prevention of parvo caused by CPV 2c in puppies with CPV maternal antibody.